In an attempt to avoid the heat, I’ve been getting out to work in the garden early in the morning every day this week. A couple days ago, I heard a bird making a noisy racket up in a tree near one end of the garden. I walked over to see what all the fuss was about. Just as I neared the tree a blackbird flew out and landed in the other end of the garden, right near the spot I was working in. It was where my blueberry bushes are located. Apparently, the bird was scolding me for being so near his breakfast. 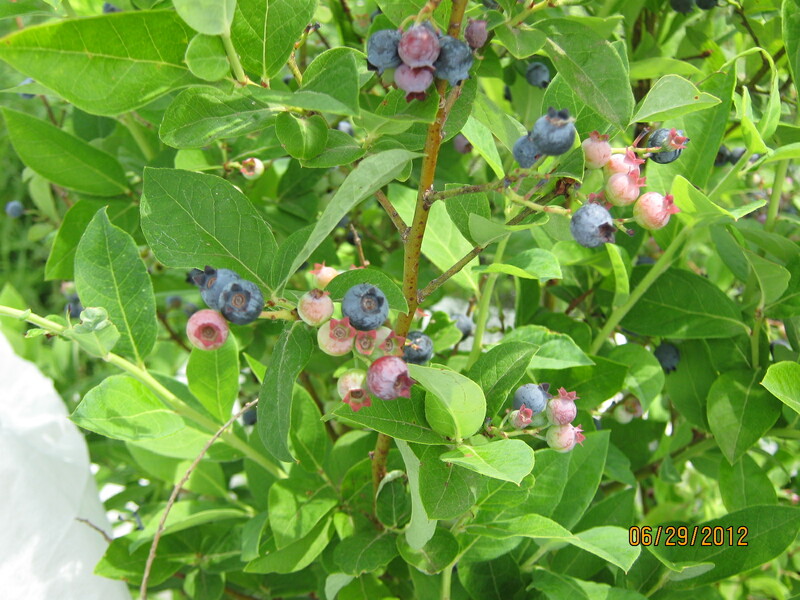 Looking closer, I discovered it was the day the first blueberries ripened. Unbeknownst to him, the bird reminded me that it was time to cover the blueberries. All kinds of birds love blueberries. Once they discover where your blueberries are, they can wipe out your whole crop in a day. I learned that lesson many years ago. At that time, I had about a half an acre planted. The fellow helping me neglected to protect the crop. I got a frantic phone call from him one day. He said that someone sneaked in overnight and stole all of the berries he was going to pick that day. He didn’t realize that a huge flock of birds found our blueberries and ate all of them. His thought was it would be nice to share a few berries with the wildlife since we had so many. I have only a few bushes in my garden now so, it is easy to cover them. I threw some row-cover material over the bushes and secured it with some clothes pins. 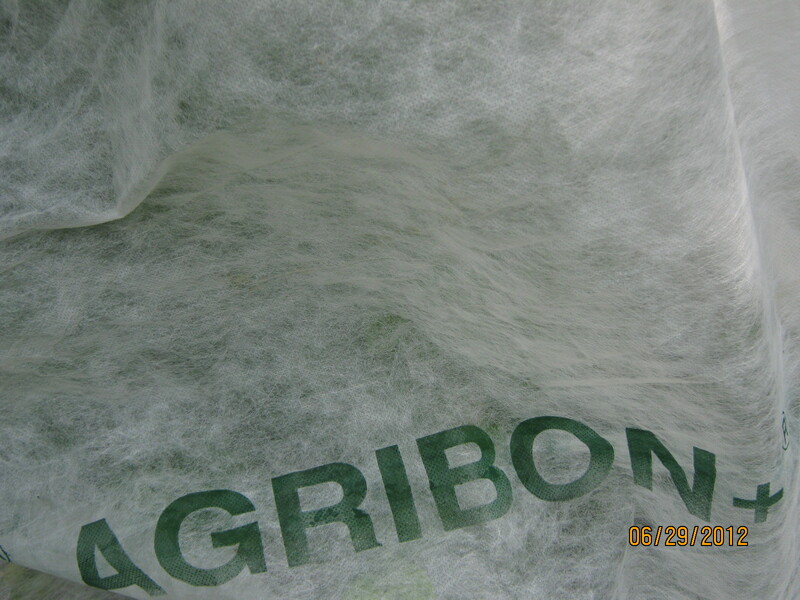 Row-cover material is light-weight and doesn’t press down the branches. Netting works fine too if you can devise a way to keep it away from the bushes. Otherwise the birds can pick the berries right through the net. Light-weight row cover material works great if you have a small number of blueberries to protect. This year, one bird’s greed helped me save my blueberry crop. The best post pertaining to sounding facts about this specific matter. When i take pleasure in a person posting this specific, it can be info i can work with. End up being doing time for it to understand ones different blogposts; you can view that will I’ll be right here to go through your recently published posts. I am just writing to make you be aware of what a magnificent experience my wife’s princess encountered using the blog. She picked up such a lot of issues, not to mention how it is like to have an excellent teaching spirit to let certain people just completely grasp several very confusing subject matter. You actually did more than people’s expectations. Many thanks for offering those productive, healthy, educational and as well as unique thoughts on this topic to Emily.